All through the long, hot summer, as fires blazed across the West, the news was full of firefighters on the front lines battling massive infernos, in forests and in cities. Oregon firefighters not only fought home-state fires but some also shipped out to other states to provide assistance to beleaguered firefighters elsewhere, including Tualatin Valley Fire & Rescue crews. Jaimie Fender, president of the King City Community Foundation, decided that just saying "thank you" was not enough, so the foundation started a campaign to collect cards and letters to be turned over to Capt. Barry Quinn and his crew at TVF&R Station 35 in King City. 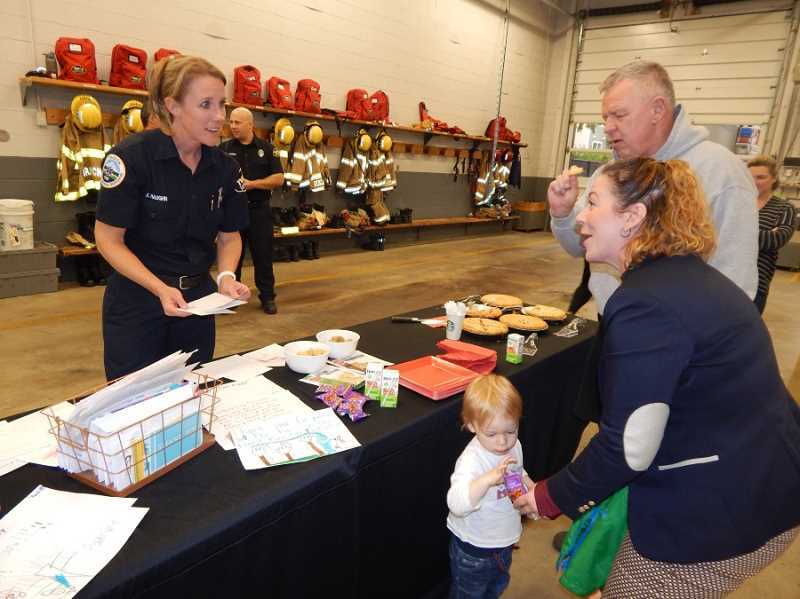 The date to turn over the cards and letters was set for Nov. 1, and with everyone's fingers crossed that a call would not come in, a party was held in the station's engine bays. 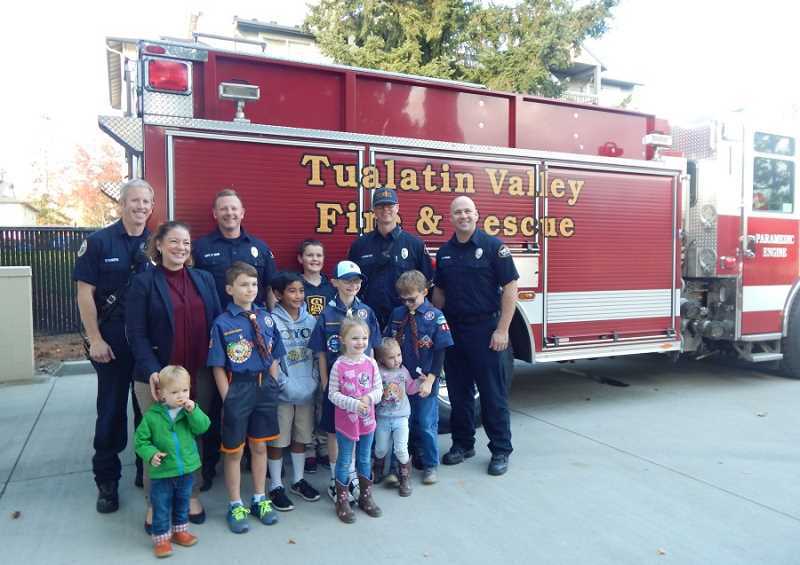 On hand were King City City Councilors Billie Reynolds and Smart Ocholi; City Manager Mike Weston and City Recorder Ronnie Smith; TVF&R Division Chief Allen Kennedy and Public Affairs Officer Kim Haughn; Bob Ellis, owner of Karate on Main in Tigard, who is Fender's dad; and members of Cub Scout Pack 419. Collecting cards and letters was a community effort, with tables set up in front of the Tigard Towne Square Starbucks on a couple Saturday mornings where paper, pens and crayons were available for folks to write notes; the Karate on Main leadership committee set up a booth at the Tigard Street Fair to accept cards and letters; and the Cub Scouts also worked to produce and collect cards. Furthermore, there were drop boxes at King City City Hall, the King City Pro Shop, the King City Civic Association Clubhouse, and King City Senior Village. In addition, La Petite Academy in Sherwood had a drop box and solicited cards, and more were mailed to the foundation's PO box. "We created the King City Community Foundation to do the Fourth of July celebration, and the foundation's purpose also is to bring the two sides of King City together," Fender told the gathered group. "I was stirred to action after the Gorge fires got so close to the Multnomah Falls Lodge and seeing the photos the next morning that the lodge had been saved. "I saw thank yous on social media and decided to do cards too," she added. "Ironically, we collected 419 cards, and Troop 419 also partnered with us as did the Karate on Main leadership committee. We wanted to put on this event to honor our local firefighters. We appreciate everything you do, and we know you support the global effort plus our community." Quinn responded, "We are honored that all of you took the time out of your day to come and say thank you. We are passionate about our job, and we appreciate it so much when come to say thank you. This summer has been busy. One of our crews was the first to get to the Multnomah Falls Lodge after the fire broke out, and they drew water from a creek to fight it along with Portland Fire & Rescue ladder trucks. "We also had firefighters working close to Mexico," he added. "I've been doing this a while, but I am still amazed at the things that happen." 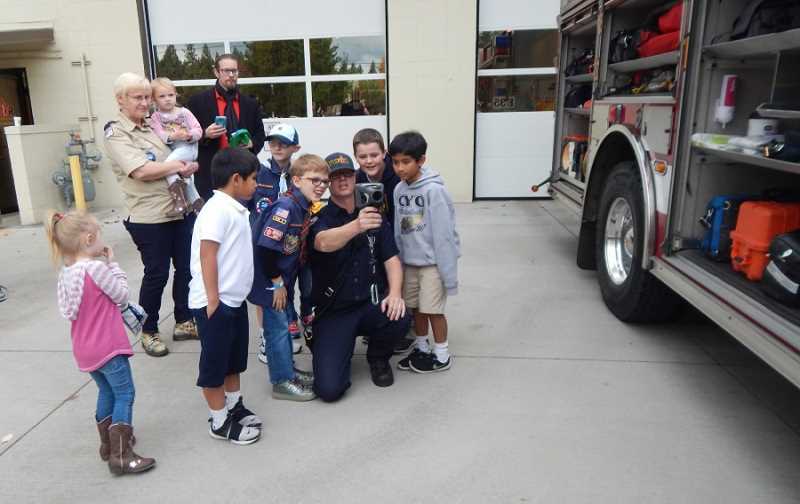 After all the kids had their fill of the sweet treats, they trooped outside where firefighter Matt Fehrenbacher showed them all the cool equipment on the fire engine. "Thank you for putting out the fire in the forest." "Thank you! For helping to save Oregon. Stay safe. May God bless you." "Dear King City firefighters, Thank you for putting out the fires. Thank you for risking your life for us. Thank you for everything you did. From, Patrick." 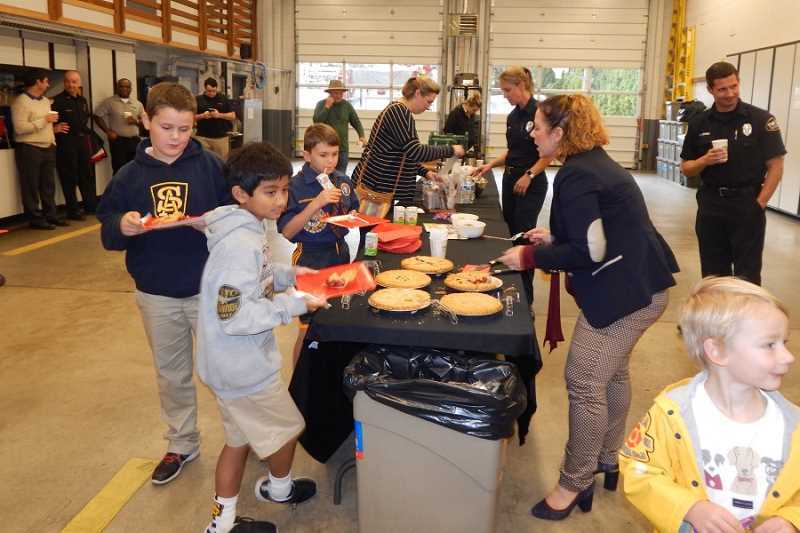 Several local businesses got on board to support the party, including the Tigard Towne Square Starbucks that donated coffee and tea, personally served by the store manager; and King City Shari's, which donated pies.